Conflict, when left to its natural processes, will lead to alienation, then to polarization, and finally to isolation. In other words, if you don’t determine to do something about the way you handle conflict, you may find yourselves alone, on opposite sides of a wall that neither of you know how to climb over. WAIT! There’s hope. Don’t give up. Go back to SEEDS FOR GROWTH #9 through #11. In them, you will find some of the reasons for your conflict. The three we covered are (1) differences, (2) power struggles and (3) faulty communication patterns. You may see yourself in one or more of these. And now, having talked about WHY we have conflict, we’d like to suggest some definite steps we can use to HANDLE conflict in our relationships. 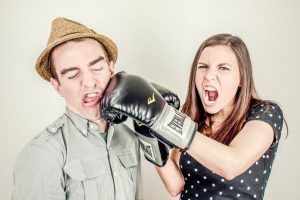 Let’s look at conflict from two different angles…from the viewpoint of the one whose spouse is angry, and from the viewpoint of the one who is the angry person. So, what do you do when your husband or wife is angry and ready for a fight? We’d like to suggest five things you can try. Some may work wonders for you. First of all, give your spouse permission in your own mind to be angry. This is probably the most important step you can take in accepting your spouse when he or she is angry — not just accepting your SPOUSE, but actually accepting the FACT that he’s angry. You can say these words to yourself, “It’s alright for him or her to be angry. He’s not a horrible person because he’s angry. It’s HIS anger, and I’m going to allow him to have it.” You will be surprised at how much of the conflict this can diffuse. It will especially help all of you catastrophizers. Secondly, don’t reinforce your spouse for becoming angry with you. That is, don’t jump right into battle with your dukes up. Instead, say something like, “I can understand your being angry and upset at this time.” That sentence alone may stop the whole confrontation. For when your spouse regains consciousness, he may not remember that he was even angry. The third suggestion you might try is to request in a neutral voice that your partner respond to you in a reasonable manner if he or she is yelling. It’s O.K. for you to say this — in a calm way. Your spouse has the right to be angry, but not the right to yell. Above all, please remember, you do NOT have to become angry just because your mate is. If you’re thinking, “I’m not made of stone. I can’t do that!” We want to encourage you to just give it a try. If you decide before conflict arises to not become angry, you might just surprise yourself. You may be stronger than you think you are. And lastly, try to identify the cues that contribute to the anger that’s going on. Analyze your conflicts. Is there a pattern to them? Are you saying or doing the same kind of things over and over again that seem to push your partner’s buttons? If you feel that conflict is a serious problem in your marriage, you would be wise to keep a note-book of your fights: what your partner says and does, and what you say and do. This will help you look at your conflicts more objectively. Well, these are suggestions as to what to do when you are on the receiving end of anger. Now, here are some for when YOU are the angry one who is ready to fight. Secondly, tell your mate you are angry in a neutral manner. You can say something like, “I’m getting angry.” “I’m losing control.” You see, when you say something neutral like that, you are not issuing a challenge to fight. But you are being honest and not swallowing your feelings. Both of these are necessary if you are going to handle your anger effectively. Commit yourself — out loud if possible — to NOT YELL or raise you voice. If both you and your mate can commit to this promise, it works better. In fact, if one or both of you are too out of control to do this, then perhaps you should agree to return to the issue after you have both calmed down. This is called “suspending the anger.” But remember, you are NOT moving away FOREVER from whatever issue you were fighting about . It is essential to get back to it in a timely manner. You don’t want to bury it alive. Issues buried alive have the annoying habit of resurrecting at the most inconvenient times. The fourth suggestion we would make is for you to RENOUNCE your anger. You could say, “I am angry with you right now. I don’t want to be angry with you; I love you. I don’t like myself in this condition.” There…you have stated you are angry. You don’t want to be, but there it is. This is then an invitation to negotiation instead of a declaration of war. Here’s a suggestion that may be really hard on the pride: Ask your partner for help. The issue of conflict then becomes a PROBLEM TO SOLVE instead of a wall of alienation. You can go one step further by giving your partner permission to let you know when he or she sees you getting angry. You might want to work out a signal or a pre-arranged word that will alert you to stop before it’s too late and you loose it. The sixth suggestion is the MOP UP. After the conflict is over, do some R and R….Review and Rehearse. First, after you both have cooled down, do some discovery together about the conflict. This is NOT for the purpose of placing blame. But rather to simply find out what triggered the conflict? Is there a pattern here? What contributed to your feelings of anger? This is REVIEW. Then REHEARSE. That is, talk together about how you both could handle a similar situation the next time it happens. Go over what you could do and say that would make it different. This is especially good for PATTERNS of conflict. If you fight about the same thing over and over again, you are going to have to start doing something DIFFERENT, or that pattern is going to develop into a very thick wall. Finally, we’d like to close this series on conflict with the best advice we could possibly offer. It is the Holy Spirit’s advice, and can be found in James 3:17-18. “But the wisdom that comes from above is first of all PURE; then PEACE LOVING, CONSIDERATE, SUBMISSIVE, FULL OF MERCY and GOOD FRUIT, IMPARTIAL and SINCERE. Peacemakers who SOW IN PEACE raise a HARVEST OF RIGHTEOUSNESS.” You really CAN handle conflict before it handles you.